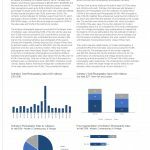 This report presents 6 monthly auction trends between 2010 and 2018. 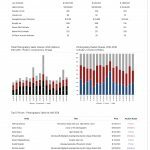 The auction analysis is part of ArtTactic’s 6 monthly reports on the dedicated photography auctions at Christie’s, Sotheby’s and Phillips in London, New York and Paris. This analysis does not take into account photographs sold at other sales, such as Post-War & Contemporary day and evening sales and other more general sales. This report is popular among art advisors, auction houses and photography collectors who want to get an overall feel for the current market trends, yet an in-depth view into some of the key current sales dynamics in photography. 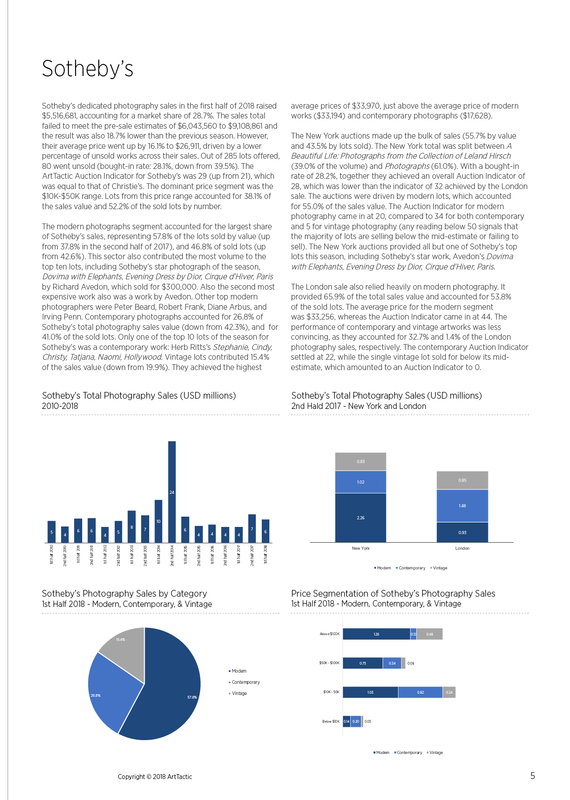 Photography Auction Sales down 29.8% in 1st half of 2018: Sales at Christie’s, Sotheby’s and Phillips dedicated photography seasons have seen a 29.8% decrease in 2018, after a strong second half of 2017. 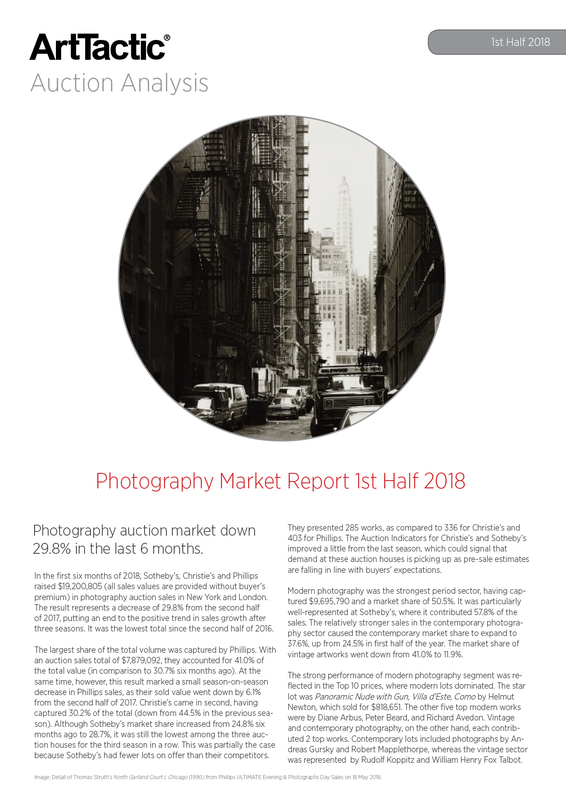 First half of 2018 sees the contemporary photography market accelerating: In the first 6 months of 2018, the contemporary photography market controlled a 37.6% market share – up from 24.5%. 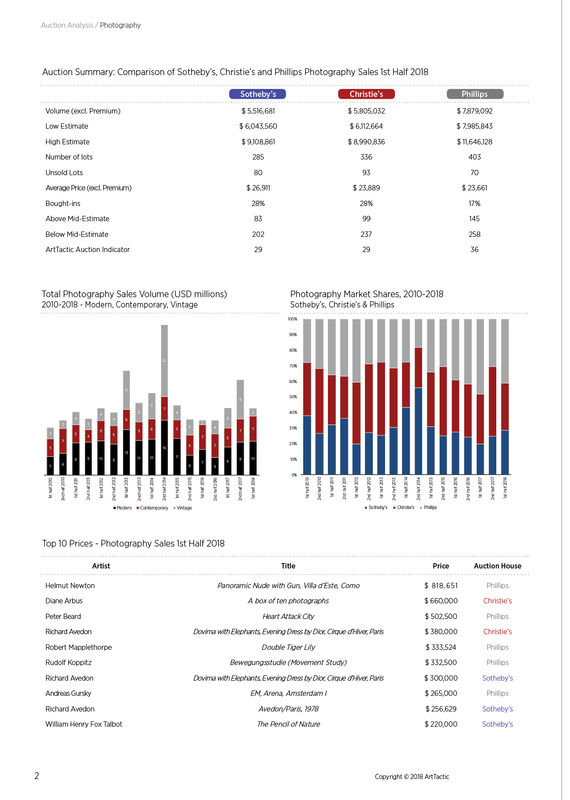 Phillips is leading the market: With total auction sales total of $7,879,092, Phillips accounted for 41.0% of the total value of photography auctions (in comparison to 30.7% six months ago). Auction House Comparison: Seasonal sales and performance comparison between Sotheby’s, Christie’s and Phillips. Auction sales trends 2010 – 2018: Six monthly auction sales trends, breaking down the sales into vintage, modern and contemporary photography. Number of lots sold: Six monthly trends of the type of supply coming to the market and how much of it goes unsold. Top 10 prices and Top 10 surprises: What sold best and what surprised the experts most? Price segmentation analysis: What is the best selling price segment by number of lots? Or how much does the top end of the Modern Photography market count in terms of market share? Geographical focus: Where are the sales taking place? Is the New York Modern Photography market stronger than London and Paris? What are the market shares? In the first six months of 2018, Sotheby’s, Christie’s and Phillips raised $19,200,805 in photography auction sales in New York and London. The result represents a decrease of 29.8% from the second half of 2017.